Even though Delhi is chaotic, messy and frenzied you would surely agree that the charm of Delhi yin this muddled lifestyle only. The hustling bustling and zigzag alleyways of Old Delhi is energetic with colourful shops and lively people. The shopping complexes of Connaught place, which offers an ample series of electronic commodities, garments, jewelleries, books, handicrafts, fashion accessories etc. A montage of faiths, cultures, customs and languages, that blends harmoniously in to one piece. The city is enchanting, a treasury of art and architecture. For decades she has witnessed the birth of religions and rituals, life and death and new ways of life again. Delhi has gained humongous importance in the world not only as the capital of India but also as a city which is being looked upon as one of the fastest growing cities in the world. But, to mention Delhi without mentioning its sister city is like having food without salt. Gurgaon has always been evenly rich and affluent in terms of popular tourist attractions like Sultanpur Bird Sanctuary, the tranquil Damdama Lake, the artificial Karna Lake, Kurukshetra, etc. Each of these tourist attractions in Gurgaon manifests the grand history of Gurgaon. Gurgaon which was originally named with reference to Guru Dronacharya, who was handed over the land to teach the art of warfare to the Pandavas. Hence the village gained the name as Guru Gram or Guru Gaon i.e. “Teacher’s Village”. The Gurgaon of today is home to offices of numerous MNCs, and has emerged as the hub of IT and several other modern businesses. The city’s growth has undoubtedly increased exponentially in terms of people, culture, economy, tourists etc. Even though it has always been portrayed as a business city but it has a charm of its own. A charm which is transported to its sister city Delhi through the marvellous Metro railway. Delhi does not belong to any one person or any particular community. Nobody can claim her to be their alone; its multi ethnicity and multi cultural beliefs are reflected everyday in every part of it. So what is new about Delhi, what is that should attract you, what is that would lure you to take out time from your busy schedule for yourself and spend in this frenzied metropolis. Well you just need to look at the right place for right moments. Let me tell you that the best way to get acquainted with Old Delhi is to walk through its labyrinths and through the city is to cycle and that too early morning. The dawn of Delhi has its own zen like feeling. The roads are nearly empty, there is a pleasant breeze and everything seems different about her. There are lot of people out there who have spent a lifetime of theirs in Delhi and probably know every nook and corner, whether it’s baffling mazes of Chandni Chowk or the all the same looking roads and buildings around Central Secretariat, but what I would bet here is not on your knowledge about the city but its moments. Like I said, you just need to look at the right place for right moments. You must have walked or driven through the Lodhi road a number of times, but try walking from Nizamuddin Auliya Dargah to Humayun’s Tomb in the brahma-muhurta : it’s the same road, the same place, probably the same rickshwalas and beggars, sleeping on the pavements but yet it’s not just amazing but a miraculously beautiful moment and I can assure you, that’s not even the beginning of what you will experience. Delhi has so much more to offer us than what we just know. Delhi is a giant city that contains an overwhelming amount of history, culture, life, food, temples, and everything else you could possibly imagine. You cannot miss the beautiful moments of the month of Ramzaan. 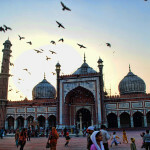 The first thing that comes in one’s mind when thinking about Delhi is its delicious food and the month of Ramzaan is the perfect time for any foodie to savor the delicacies of Iftar. 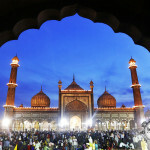 Ramzaan is the time when every dilliwala makes a trip to Jama Masjid to savour the flavors of iftar. A walk to bustling zigzag alleyways of Jama Masjid would be meaningless without experiencing the whole process of iftaar. And of course the 67th Independence Day of India is almost there, a moment of celebration, a day to pay tribute to the martyrs who struggled and sacrificed their presents so we can live in a better future. No matter what are the conditions today but we owe it to them, our freedom, and yes that ever present ray of hope. One thing besides the Independence Day celebrations that you cannot miss being part of is the Kite Flying in Delhi. It is a much awaited event that takes place in Delhi, and children and kite flyers wait for this opportunity to flash their vibrant flying machines and watch the spectacle as they race against the wind high above, surpassing all others. There are some famous parks like India Gate, Red Fort, Ramlila ground or any parks in the locality can be used. As they say in the Vedas “Tat Tvam Asi” or “Thou Art That” which proves the philosophy that God and Self are one. You can go back and rediscover the precious values, that all reality hinges on, the moral values and that everything has a spiritual control. Being spiritual does not just means to be religious. It’s about understanding your inner self and trying to give meaning to the world and to the unexplained. Keep our minds on a positive train of thought and live courageously. Well we can actually keep on talking about it and probably it would never end. Even those who have lived here since their child hood get amazed to see places they had never even heard of or they had not even a slightest bit of idea it’s not just a city they are living in, but a legacy left by people of diverse cultures and beliefs, more than 2000 years old legacy. Well the more you talk about it, the more exciting it gets, and it’s absolutely fine if it lures you to take a weekend off and take some time out for yourself.